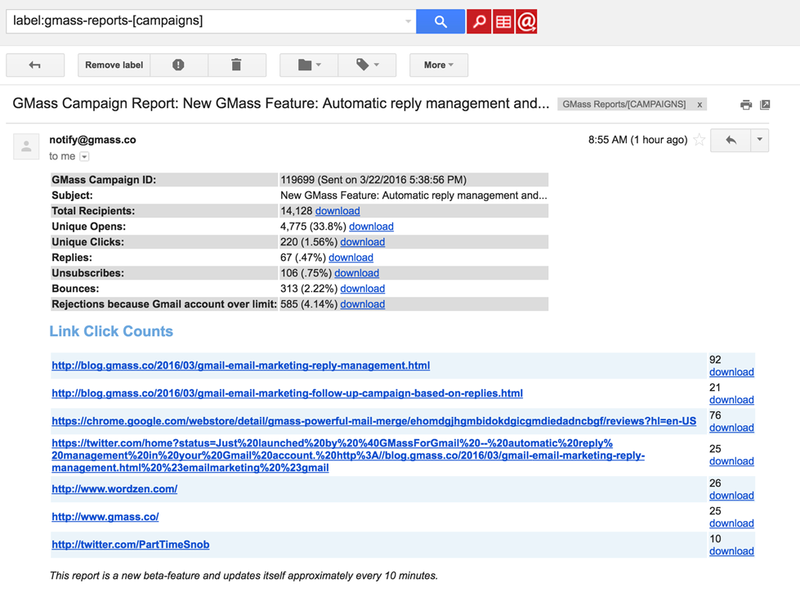 A couple weeks ago we started pushing new campaign reports to the [CAMPAIGNS] Label under the “GMass Reports” Label in your Gmail account. Yesterday, we enhanced that report to include download links next to all major metrics. Now, along with seeing how many people opened, clicked, replied, bounced, and unsubscribed, you can now click the “download” link to see exactly who took each action. You even get a detailed breakdown of who clicked on what URL, if you turned on the option to track clicks in your campaign. This is useful if you want to sync mail merge campaign data back to a CRM system like Salesforce.com or an internal database. This tool is mindblowing !! I have started using Gmass and absolutely loving it. Regarding this reports? How can I open it ? Is this feature is included in free version ? Thanks for the kind words! You can access your Campaign Report under the GMass Reports -> [CAMPAIGNS] label. This feature is available to any GMass user, including free accounts. I don’t see the label you’re referring to in your comment above. No I need to have sent emails in a campaign for the label to be generated? I’ve just today gotten a subscription to GMASS and installed the extension, so i’m quite new. I don’t see the label either for GMass Reports…..perhaps you have a user solution for this in 2018? How to extract open label emails. You can actually download your unique opens from your campaign reports to get a list of all recipients who have opened your email but unfortunately, this is separated on a per campaign basis since not all campaigns have the same recipients so we couldn’t set a global list for this. My campaign summary reports will consistently not download even though the other ones will, help! Please contact our support team at https://www.gmass.co/blog/how-to-get-support-from-the-gmass-team/. Please indicate the campaign ID of the campaign you’re referencing in the email.